The Joint Forum Voluntary and Community Sector panel hosted Ian Maye, the new Community Cohesion Deputy Secretary within the Department for Communities to inform the sector on his vision for the sector's role. Ian Maye began the briefing by informing attendees of the new organisational structure of the department. He made a commitment to raising the profile of the Voluntary and Community Sector Unit and ensuring the importance of the sector was understood throughout the whole department. Ian stated that the priorities for the Department for Communities was to, like all government departments, deliver for the NI Executive and contribute to the Programme for Government. 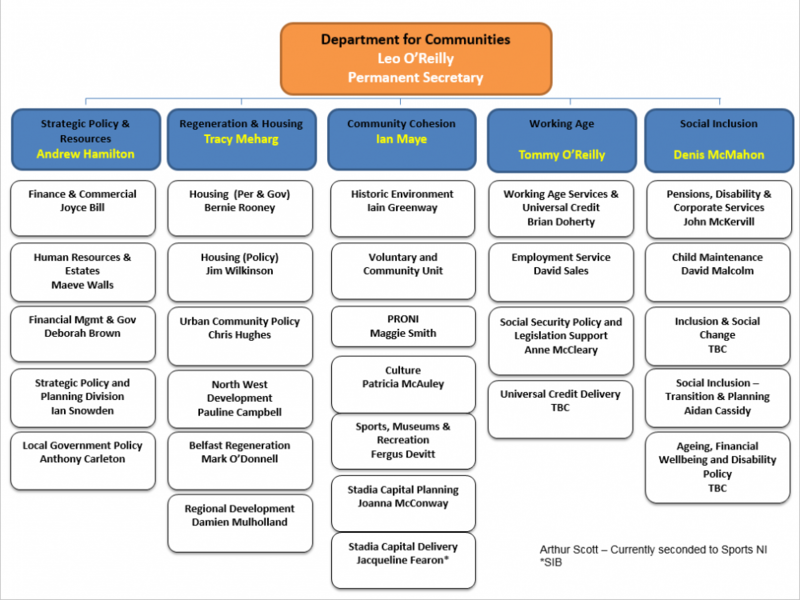 Ian added that in the context of the departmental restructure, the aim was to create a cohesive and coherent department that will deliver effective strategic leadership and coordination in the support Ministerial and PfG priorities and to deliver and develop policy and operational responsibilities across a wide and diverse range of functions. Ian was optimistic about the capacity of the new Department to deliver change that mattered for the sector and their service users. Given the amalgamation of many functions relevant to the sector’s work under one roof, Ian was confident that policy priorities could be achieved that were previously unsuccessful. Aidan Cassidy, Head of the Social Inclusion Unit, provided more information on the work the Department was bringing forward. Aidan praised the sector in the work they carried out on behalf of and in cooperation with government, and echoed Ian’s commitment to ensuring the sector’s work was understood and valued. Aidan stated that the concept of working in partnership was the foundation of this body of work. Help develop and wide staff experience and skills.